Have you ever heard great things about a restaurant then experienced almost exactly the opposite? How did that make you feel? If you're like me, you probably felt a mix of frustration, sadness, maybe some anger, and even a sense of betrayal. Such is the nature of our emotions when we get our hopes up then have them dashed to pieces on the rock of bitterness. I generally refrain from blogging about negative dining experiences, preferring instead to use Twitter and/or Facebook to share my story. In this case though, I felt that after two bad dining experiences in the span of about a month, it was time to speak my mind. My good friend Dan Hammer and his lovely wife were in town this past December, and despite his trip being short, we vowed to get together for dinner at a nice restaurant. He and I both did some research and settled on Paley's Place, in Northwest Portland. To a man, everyone I told about our upcoming dinner had good things to say, noting their food is locally sourced and organic as well as the wine list being very well put together. In the interests of keeping this blog constrained to one page, I'll refrain from any chronological narrative. Arriving at Paley's, we four were escorted to our table in what seemed like the cocktail lounge. If you've been there, imagine walking in and looking left past the bar, towards the back of the restaurant. Since the occasion was a special one (I get to see Dan only once or twice a year, he lives in White Plains) we both brought bottles of wine. 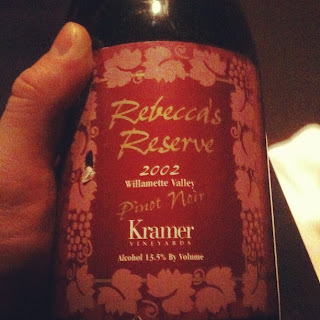 His was a 2008 Sojourn pinot noir, one of his favorite California producers, and mine was a 2002 Kramer Vineyards Rebecca's Reserve pinot noir. I was able to get our server to decant each for us but it would have been nice to have the sommelier come over and say hello too. Becky chatted with our server for a moment, explaining it was her family's vineyard and asking if she (server) would like a pour. All told, we sent back nice sized pours of each wine, and the server did come back to express her enjoyment. What surprised me was that we were charged corkage for both bottles. As an industry courtesy, corkage is usually waived. Also, in my experience, when you send a pour back to the kitchen corkage is often waived. Our party had two industry people, myself and Becky.What bugs me the most is that these people are the same ones going to tasting rooms all over the Willamette Valley (and other places) and expecting their free tasting and industry discounts on purchases. We in the wine industry are happy to extend discounts and are we wrong to hope for some reciprocal discount? I wrote this off to poor server training or poor management. What I struggled to write off though was the average food. I, like most humans, love salt but use it judiciously. At Paley's, everyone's dish was heavily over-salted. Why? The diners can always add their own salt and I would imagine any kitchen worth their proverbial salt would want diners to taste as much complexity as possible in the food. When everyone at the table notices a problem with their entree and there are three separate entrees, something is wrong. Lastly, upon depositing the check, our server took off for 20-30 minutes, leaving us sitting around waiting for our payment to be processed. For such a heralded establishment, Paley's Place sure screwed the pooch that Saturday night...A good rule: Don't piss off industry people, it gets around. As a restaurant veteran myself, I understand there are variations in the food depending on who is in the kitchen that night, but I really expect more from a high end place. Refusing to write off Portland's epicurean scene (that would be highly irresponsible), we looked forward to our next outing at a highly regarded place. That outing was this past Saturday at The Bent Brick, located in Northwest Portland. What intrigued me the most was their tasting menu, in the past I've had some amazing meals courtesy of a chef's willingness to prepare his entire menu for us. Again, positive reviews flowed in from all corners. The occasion: celebrating my good friend NubianOR's birthday! She and her husband, along with some mutual friends, had spent a wonderful day tasting wine before making their way back to Portland for this much-anticipated dinner. The experience turned out to be worse than at Paley's Place. First the good: I liked the decor and vibe at the Bent Brick. They do a lot of things right, creating a fun atmosphere and offering a wine list featuring only Pacific Northwest wines...on tap! I was impressed and happy to be there. Our friend Tamara had been there before and suggested we do the chef's tasting menu. Priced at $55 a piece, it was certainly expensive but she had done it before and told us that there was a lot of food and that couples could split it up and still be full. Of further note, the Oregonian also suggested sharing the tasting menu, reasoning that the amount of food was sufficient for two people. Here too, Becky and I brought wine, two bottles from Kramer Vineyards. We chatted up our server and sent back a nice healthy pour of the Kramer Vineyards Brut. I'll cut to the chase for their first #fail moment: They charged us corkage, despite there being three industry people, and we are also food and wine bloggers! While I NEVER expect corkage to be waived, within the service industry there is usually a better sense of helping each other out. Also, since we were a party of eight, there was automatically a gratuity charge added. Our server was getting a tip no matter what! Next, when we presented our request to the server, asking for three tasting menus, to be split by three couples, we were greeted with an exasperated eye roll and the lazy-server anthem "let me go see if it's ok with the kitchen". Apparently the kitchen was able to accommodate our horrifically complex request. So nice of them. But wait! Instead of bringing out three of each of the courses, one for each couple, they decided to screw us by bringing out community-plated courses! By doing this, the Bent Brick got away with serving far less food than we'd normally get. Furthermore out of our party of eight, one couple didn't order the tasting menu but for some reason they had to wait for almost two hours to get their entrees. More issues attributable to poor management? The tasting menu came out at a glacially slow pace, our dinner took almost three hours to complete, which I couldn't believe until I checked the time myself. 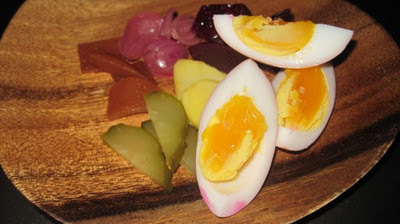 In the above picture, each person gets one sliver of egg and one sliver each of the assorted pickled vegetables. Yes, I get that it is a "tasting menu", but seriously? For $55? The plate above should have been for one couple, and three just like it should have come out. Before anyone has ideas that we were trying to get out of there on the cheap, we weren't. Our party ordered a full carafe (that's how they serve their kegged wine) and seven beers. We were happy to spend our money there, provided the experience was worth it. In this case, at the Bent Brick, it was not. I have no interest in recommending that restaurant or returning, despite the cool decor and thoughtful wine list. At this point I am wondering what is wrong with the service industry here in Portland? Remember, these servers and managers are the ones expecting deals all over wine country and at other restaurants. I've had great meals in Portland, at The Country Cat and Gruner, so I know Portland is capable of wonderful food AND service. In the quest to be relevant though, is managerial proficiency sacrificed? Why is good service so sporadic? I struggle with these two bad instances because I am both a restaurant industry veteran and wine industry veteran, meaning I have a good idea of how things should work. When they don't, I have less sympathy because there really is no excuse for poor service.. The birthday girl herself posted an account on her blog, titled "Dining Debacle". Check it out for another view on our experience at The Bent Brick. Have you eaten at these restaurants? Share your experiences, good or bad! When you asked both places to waive the corkage fee, what did they say? Why would I ask? The point of extending courtesies to industry is to show appreciation and respect as well as the understanding that the courtesy will be reciprocated. You all made my birthday special. This is one memory that will always have us giggling right? At least we can sit back now and laugh about it, but it's just too bad that your birthday meal had to go that way. AH, wow that is baaaaad. I'm glad you let the world know about it. As for tasting menus, I've always been curoius and heard good things about the Uptown Billiards Club in NW. Anna, I think that is where we should go next. I'm still shaking my head just READING about these experiences. I've been in customer service for quite a while and...yeah. I think you'd get better service at a McDonald's...which is saying A LOT. Alina I did a lot of head shaking as well, but it is what it is. I can't change the past, only hopefully bring some awareness to what *might* happen if you visit the two restaurants I mentioned. It's my hope that those who do visit Paley's Place and The Bent Brick have great service and food though. @ Anonymous: There is no Tracy's in Dundee. Abby is at Tina's. At least we know you aren't affiliated. But yes, her food is amazing. @Joel thanks for the recommendation for Tina's, I've been wanting to try it out. When they reopen I'll stop in for lunch. Win Tickets to the ZAP Tasting in San Francisco!